It’s not often that the physical world changes overnight. On January 20, though, it did. On that day — when Donald Trump was inaugurated — our national efforts to combat the causes of global warming were shelved, leaving Americans on their own to protect themselves from its effects. Trump’s plan for his first 100 days calls for backing away from the Paris climate accord, scrapping the EPA’s Clean Power Plan, and installing a climate denier as the agency’s head. Among the first orders he issued were calls to complete the controversial Keystone XL and Dakota Access pipelines. Congress likewise seems ready to do nothing to slow flooding along our coasts, drought in America’s breadbasket, or the spread of asthma and insect-borne diseases all over, among the many other threats across a warming America. But there may be one positive result from Washington’s inaction: Now we won’t be paralyzed by the hope that federal regulations will fix everything. We can instead turn our attention to defending against the rising costs and disruptions of warming right here in our own neighborhoods. Warming is global, but its effects are very localized. Each community faces different threats and costs, but with one thing in common: We’ll need to rely on local governments, community organizations, businesses, and families. Take flooding as an example. Around the country, nearly 300 electric generation plants — including more than 100 nuclear plants — plus 12 major airports are so close to sea level they need to be moved or protected. It’s going to be up to state and local governments to fortify them. 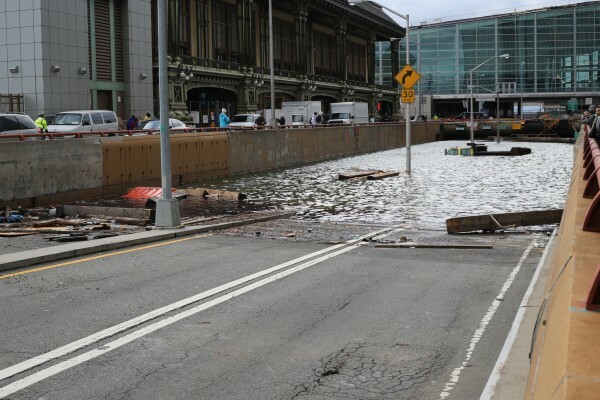 Elsewhere, New Yorkers are contemplating how to relocate or protect 104 public schools, 85 houses of worship, and 16 hospitals that are within 6 feet of today’s sea level. In Rhode Island, Newporters are mulling how to safeguard the 968 historic structures that lie in the floodplain — and the tourist revenues those structures attract. Then there’s extreme weather. Many towns must figure out how to finance projects to control sewer overflows and water pollution caused by increasingly severe downpours. Riverside and coastal communities should be planning seawalls and other barriers. New zoning regulations can reduce watershed loss and repetitive storm damage. Meanwhile, cities may want to expand heat-wave emergency plans, or try to cool themselves by planting trees and mandating reflective or “green” roofs. At the neighborhood level, communities are expanding local food sources in case reduced rainfall cuts into the nation’s supply of groceries. Families should meanwhile be preparing for increased cooling needs, worsening allergies, and water shortages. Not least, property owners need to contemplate declining property values, particularly for flood- and drought-threatened homes and businesses, while municipalities need to deal with the resulting erosion of their tax base. As we turn our attention to these effects of warming, we need to encourage inventors and entrepreneurs. Home cooling, water purification and reuse technology, hydroponics, and flood control are only a few of the candidates for innovation. In one sense, of course, nothing changed on Inauguration Day. Even if Washington dramatically increased programs to slow warming, the atmosphere we’ve created has guaranteed rising temperatures, increased flooding and droughts, and other changes over the next 20 years or more. What has changed is that Washington’s refusal to tackle the causes of warming can galvanize us to think more clearly about how to protect ourselves against its effects. Now that we know the cavalry isn’t coming to stop climate change, it’s high time we start getting serious about how to adapt our own communities and homes. The post Climate Change Is Now a Local Issue appeared first on OtherWords.